The Hamilton Ticats used a second half surge to win their final preseason game on Saturday afternoon, defeating the Montreal Alouettes 30 to 15 at Molson Stadium. After giving up 14 straight points to start the game, the Ticats went on a 30-point run of their own to earn the road victory. The points came early for the home team, with Boris Bede hitting a field goal three minutes in to open the scoring. Their defence was equally as stout, not allowing a Tiger-Cats first down until midway through the second quarter. Seven minutes after Bede’s field goal, Tyrell Sutton scored on a 10-yard run to put the Als up by 10. By the end of the quarter, Montreal’s lead was extended to 13 off the foot of Bede. 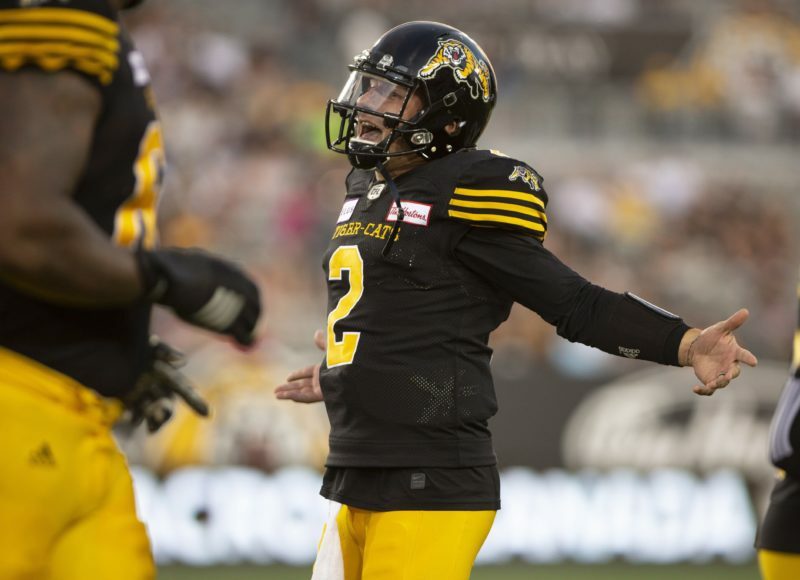 The Ticats awoke in the second quarter, largely thanks to the appearance of quarterback Johnny Manziel, who came in to replace starter Bryant Moniz. The 29-year old Moniz finished the game 3 for 7 for 17 yards, an interception, and zero passing first downs. 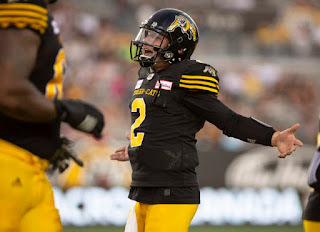 Immediately after entering the game (and helped by a Stefan Logan punt return fumble), the Texan marched the team downfield, connecting twice with running back Alex Green and tossing his first career CFL touchdown pass to get the Ticats on the board. Manziel also drew a roughing penalty during the drive. Willy, who’s expected to be Montreal’s opening night starting quarterback, came out for the third quarter before Garrett Fugate took over. Willy ended the afternoon 10 for 18 with no interceptions. For the second straight preseason game, he failed to throw a touchdown pass. Fugate, a 24-year old out of Central Missouri State making his first CFL appearance, finished 3 for 6 with no touchdowns. Willy and Fugate combined for just four passing first downs in the game’s final three quarters. Manziel looked effective in the second half, scrambling to his left and finding receiver Bryce Wilkerson for 13 yards in his first play of the third quarter. Five plays later, Ticats kicker Lirim Hajrullahu kicked a 27-yard field goal to cut the deficit to four. Hamilton was helped out by a strong defensive effort in the second half, constantly getting in the face of Als quarterback Garrett Fugate after he entered the game. On the first play of the fourth quarter, a Fugate pass was intercepted by Ticats defensive back Joel Ross, who ran it back 38 yards for the touchdown to give the Ticats their first lead of the afternoon. Manziel came out of the game midway through the fourth quarter. His afternoon ended with 12 completions, 88 passing yards, and a touchdown pass. He was replaced by 24-year old Tulsa product Dane Evans, who completed his first two career CFL passes, including a 47-yard strike to receiver Justin Buren to bring the ball to the Als’ one-yard line. Tiger-Cats running back Sean Thomas-Erlington, a Montreal native, ran it in to the end zone the next play to give Hamilton a 30-14 lead. Montreal ends its preseason with no wins and no touchdown passes. They open the regular season in BC on Saturday. The Als then host the Winnipeg Blue Bombers in their home opener. Meanwhile for Hamilton, it’s a trip to Alberta to kick off the campaign. They open the season on Saturday in Calgary versus the Stampeders before facing the Edmonton Eskimos at Commonwealth Stadium the following week.